Over the past two decades there has been a growing attention to environmental matters in both scientific research and public interest. Global concerns have arisen particularly surrounding global warming, the emission of toxic chemicals, threats to biodiversity, radioactivity and the depletion of the world's resources such as fisheries and forest cover. The expansion of environmental interests is evident in numerous ways. These include the rise in the number of environment-focused grass-root and non-government organizations, the proliferation of official environmental agencies at national levels, and the growth of 'green' consumerism. These examples demonstrate a set of ways in which a global 'consciousness of connections' is taking form. Scientists, policy-makers, and the general public have become increasingly aware of the connections between environmental domains, and how damage or depletion in one affects numerous others. Yet another kind of developing 'consciousness of connections' involves the evolving links between individuals, groups and organizations concerned with environmental issues around the world. They are ever more conscious of each other, are creating coalitions for effective public campaigns, and are increasingly gaining the ear of national and international policy-makers. 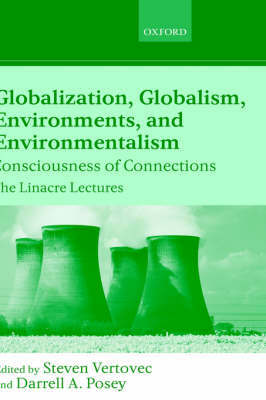 This volume presents the views of a number of leading figures concerning the nature of environmental consciousness and the emergence of connections linking globalization (processes of intensifying social, political and economic networks), globalism (our sense of the world as a whole), specific environments (such as rainforests or cities), and environmentalism (expressed in the activities of social movement organizations).